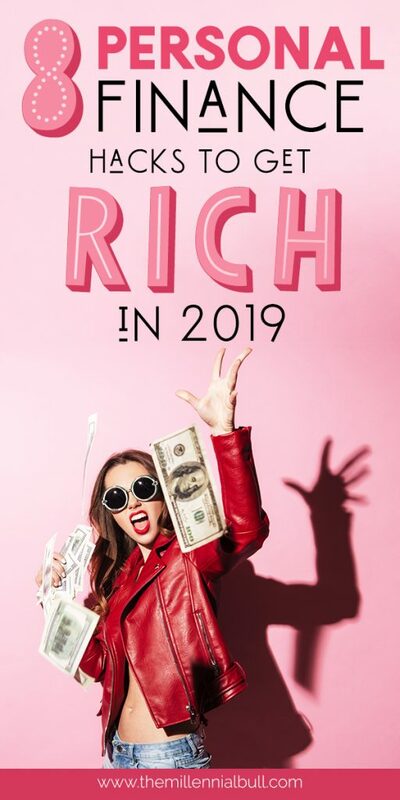 I don’t know about you, but I want to get rich in 2019. But did you know that getting rich doesn’t always mean making more money? 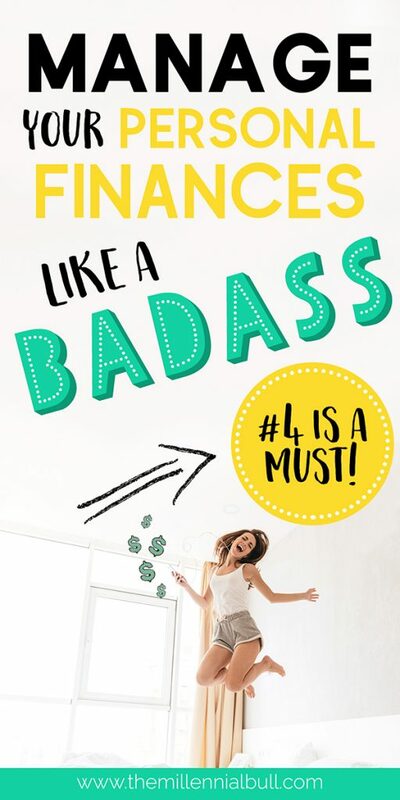 There are a variety of ways that you can adjust your personal finance habits in such a way that you are saving money in places that you never thought to, or never knew you could. 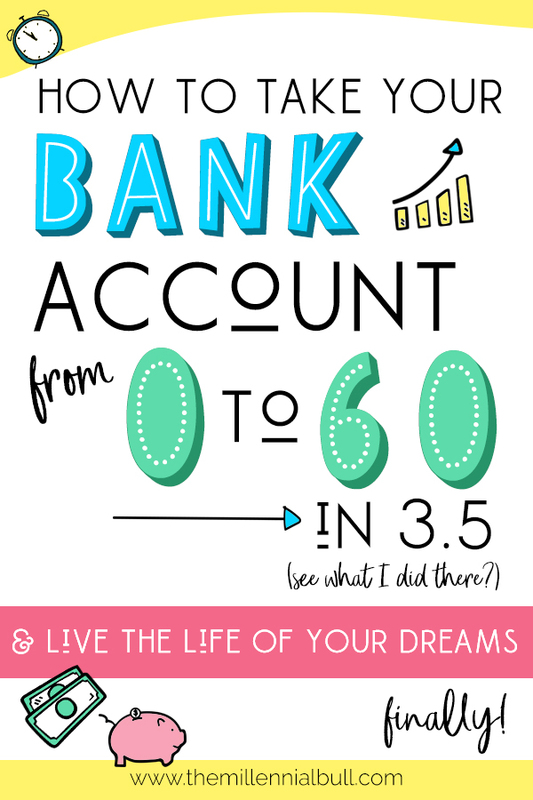 The more money you save, the better your bank account looks, right? The thing about controlling your personal finances is that you can never stop learning new ways to be financially mindful. While there are quite a few small ways you can save money, like packing your own lunch instead of getting take out or getting a reusable water bottle rather than buying disposable… we want to focus on the big ticket methods of beefing up our bank accounts.  Bonus: Read until the end to learn how you may be able to earn some extra cash today! There are always ways we can earn more money, but there are even more ways that we can find and save money that we already have. 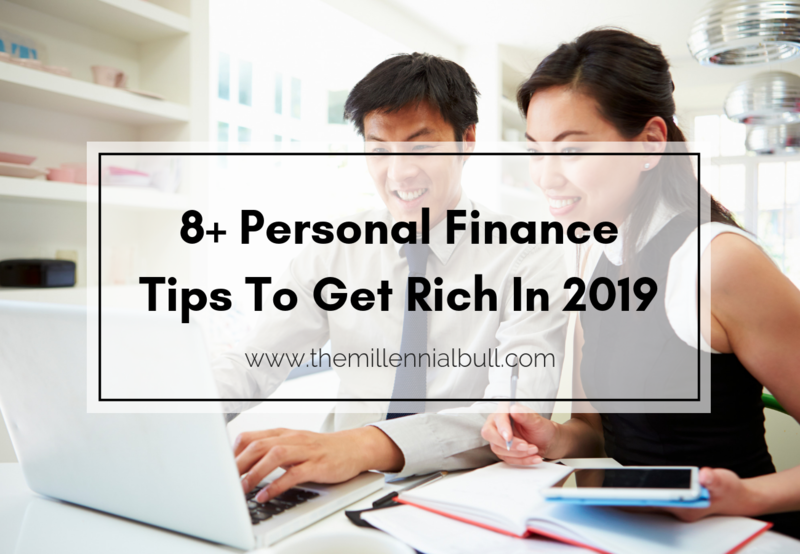 From money makers to money savers, here are some awesome personal finance tips that will help you get on the path to wealth. This post may contain affiliate links. For more information, please see our disclosure. 1. Budget, Budget & Budget Some More! c) have a budget and follow it. Budgeting can be stressful, eye opening and satisfying. Stressful, because it may hurt a little to see all those numbers on paper and to put a cap on your variable expenses; Eye-opening, because you may not even realize how much you are overspending (or how much extra income you are sitting on); Satisfying, because you’re taking the time to get your personal finances in order. Budgets are about as personal as it gets! Log your income and expenses for previous months to get an idea of what your spending habits are. From there, create a budget that you can stick to and do your best not to stray. To get started, try our Personal Budget Spreadsheet to begin logging all of your income and expenses. It will help you visualize exactly where your money is going so you know where to cut back or make adjustments! You’re your own boss. Win! Mo’ money, less problems. That’s what we like to say. Making more money is the most obvious way to get rich faster, right? What kinds of side hustles can you start today? Those who want to work from home have a variety of options, including taking surveys for cash, becoming a virtual assistant, or teaching English online, to name a few. Sure, these won’t solely make you rich, but a healthy combination of extra work can certainly bring in some extra money. If you can make that income passive, even better! 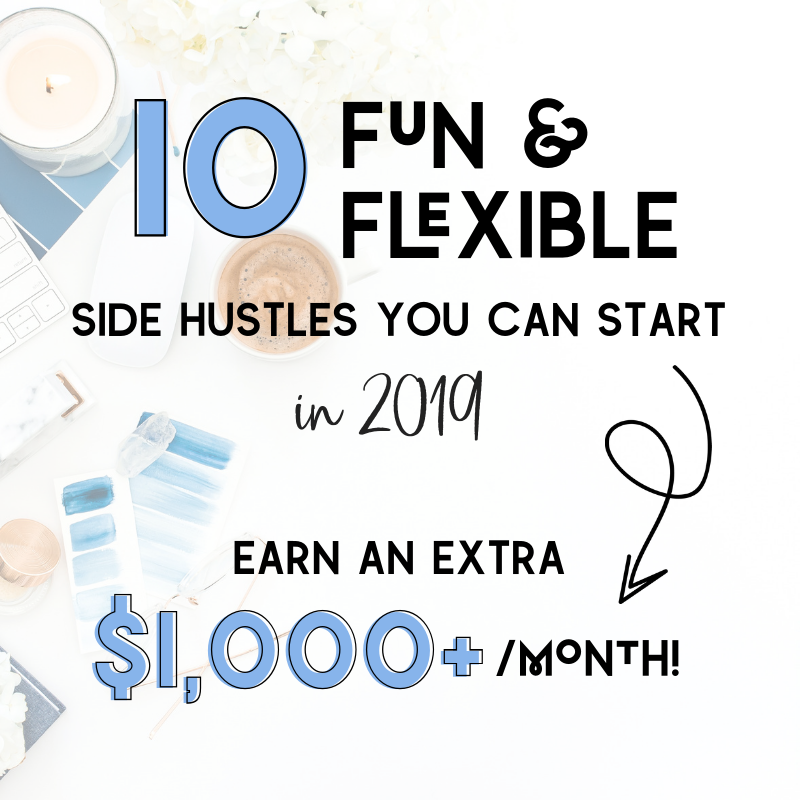 For a more comprehensive list of side hustle ideas, check out this post: 10+ Fun & Flexible Jobs To Earn You An Extra $1,000/Month. Most wealthy individuals collect from multiple income streams. The most successful people have worked more than one job at some point in their lives, and more often than not, that second or third job was one that he/she created for themselves. Diversify your income, your bank account will thank you. To many, investing is a scary thing. It can be incredibly difficult to decide what you are going to invest in because there are so many factors to consider: the risk, how much you can afford to invest, what type of investment means most to you (you don’t want to put your money on just anything), etc. If you are interested in investing but don’t have a very large slush fund, a great way to start is with micro-investing. Rather than investing a few hundred or thousand on a stock, why not try $5, $25, $50 here and there? Investors can join Swell for a minimum of $50! Swell is an impact investing platform that helps you invest in high-growth companies solving global challenges. Swell’s portfolios are of publicly-traded companies, innovating in high growth industries like renewable energy, green tech, disease eradication, clean water, zero waste and healthy living. 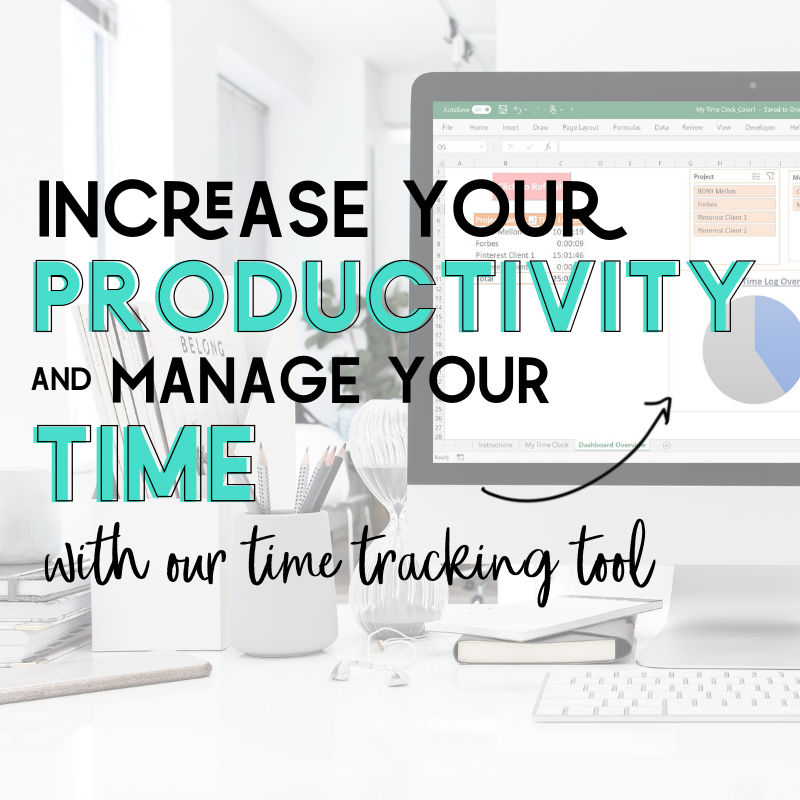 You can build your own mix of companies, monitor your investments’ progress, and watch your money grow! Acorns is a favorite among newbies because it is one of the only ones that allows you to invest your spare change. The purpose is to show users that anyone can grow their wealth, because what you are investing is barely noticeable! There are over 4,000,000 using the platform already. With Acorn, your spare change or extra cash gets invested automatically as you go about your day with Round-Ups and Recurring Investments. All you have to do is sit back and let your money grow over time in diversified portfolios. Meet your next favorite robo-adviser! Betterment is and automated investment service that has no account minimum. It offers up to one year of free management before charging just 0.25% of assets under management annually, which is less than a traditional adviser. Once they learn a bit about you and your investing goals, they will build a personalized portfolio with a risk level and investment mix that suits each goal. If you’d like to adjust that mix, you can! Some goals include: safety net, retirement, general investing, and smart saver. You can start investing with Stash for as little as $5! What I love about Stash is that you learn as you go. I am not as privy to investing as Sam is, and this was a great way to put a few bucks on things that mattered to me. From innovation to the environment, users can choose a selection of stocks that reflect their interests, beliefs and goals… and the app will do the rest! You should also note that investing doesn’t just mean stocks. You can invest in entrepreneurial endeavors, real estate, and more! Learn more tips & tricks for making and saving money! Nobody expects an emergency. That’s why it’s called an emergency. But just because you hope to never experience something that causes unforeseen expenses, doesn’t mean you shouldn’t be ready for it. What would you do if you lost your job tomorrow? No matter how confident you are in your career, it’s possible. What if your car breaks down and your mechanic finds that there is a much bigger issue beneath the hood? Cars are strange, money-sucking beasts. What if you or someone in your family needs unexpected medical attention? Would you have enough money to make it through? If you haven’t already, it’s time to start expecting and preparing for the unexpected. If you don’t think you have the funds to spare, start small. Think about the things that you already spend money on that you can scale back on. Even if you are only putting aside $5/day or $20/week… you likely won’t even miss it. If you WOULD miss that amount of money, it may be time to revisit your budget and learn ways to live more frugally. Do what you can to start, then slowly build your way up. IMPORTANT: An emergency fund is for ONLY that. Emergencies. Don’t dip into it when you don’t have enough to grab dinner with your friends or buy someone a gift for their birthday. While starting a blog could totally fit under the “start a side hustle” category, we thought it deserved its own explanation. This is because blogging can be a HUGE step toward financial freedom; one in which your earning potential is unlimited. And if we are being honest, blogging is so much more than a side hustle. It’s a legitimate business. 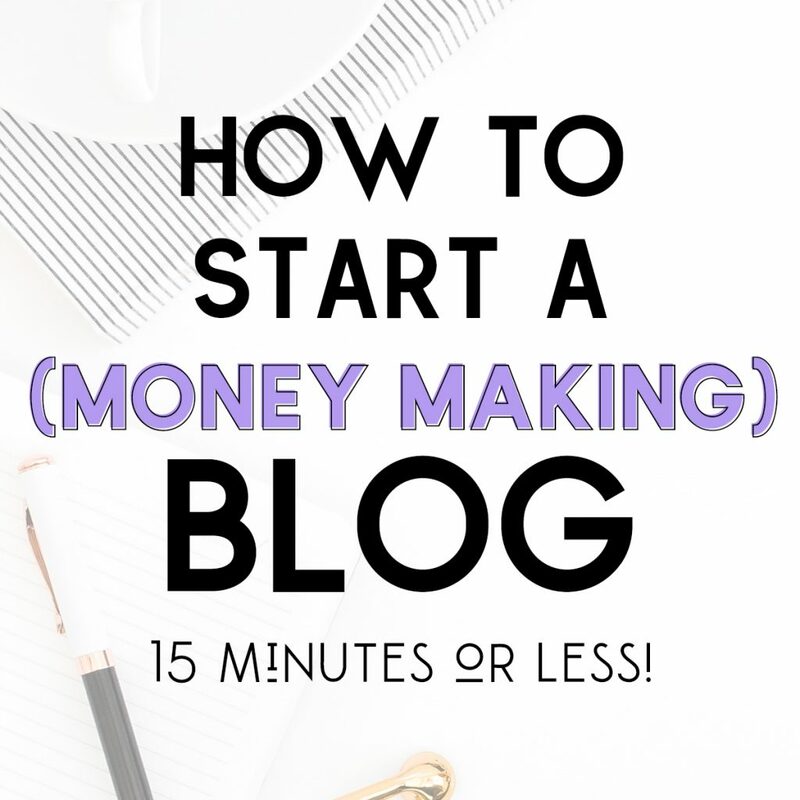 Learn how to start a blog here. Case in point: Michelle Schroeder of Making Sense of Cents. Michelle is the queen of blogging, consistently earning $100,000/month. How does she do this? Well, her blog income is pretty diversified, but a huge source is affiliate marketing, for which she is a master. 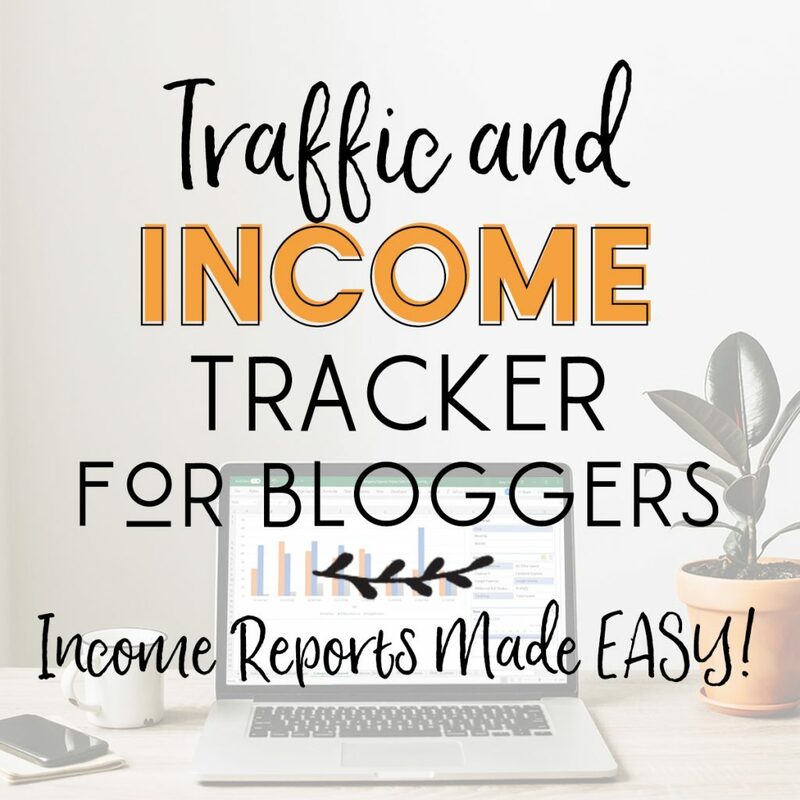 Through her course, Making Sense of Affiliate Marketing, we learned everything there is to know and then some about blog monetization, which has helped us earn a helpful chunk of extra cash. In our first month after re-launching our blog, we earned $179.27! You can sign up for Making Sense of Affiliate Marketing here. Monetizing can be a killer way to earn passive income… especially on viral, evergreen content. …IF your purpose is to lower your interest rate. Paying off student loans can be an absolute nightmare, especially for those who choose to go to schools beyond their means (kudos to you, just know what you’re getting yourself into!). Students can spend well over a decade paying off those loans. In addition to the hefty cost of higher education, this is also largely due to accruing interest and the tendency to pay the minimum amount due. Refinancing a loan can lower your interest rate which will give you a lower monthly payment, and ultimately save you money in the long run. However, if you are refinancing your loan to get more time to pay it off, you will be paying more money overall even though your monthly payments will decrease. This is because you will accrue more interest. So, assess your long-term plan and payoff capabilities to make sure refinancing is for you. One year, I tried the 52-week money saving challenge, where I made a cash deposit into a mason jar every week. The amount I would pay each week would equate to the week of the year it was. So, on week one, I would put away $1. On week two, $2. Week 25, $25. On the last week of the year, $52. At the end of the year I had put aside $1,378. At first it was pretty simple… I hardly noticed the small denominations that I was putting away. “This is cake,” I thought. Of course, as the year went on, it got harder and harder. But with the end goal in sight and knowing just how much I could save in cash, I kept on! Obviously, you don’t have to do it in cash. You can create a separate savings account within the same bank that is designed for this exact purpose where you can do this every single year. All you do is electronically transfer money from one account to the other every week. Some banks will allow you to automate this process but you still have to make sure that your original account has the necessary funds so that you don’t get hit with an overdraft fee. Not only do money saving challenges save you money, but they help teach you how to be disciplined, and how to cut back in other areas in order to fulfill your obligatory deposit. Credit cards are the downfall of millennials because it is way too easy to get one, and even easier to fall into debt. People charge everything these days, often when they don’t have the cash-flow to pay it off. One of the more challenging personal finance tips on this list is not spending what you don’t have. Meaning, if you are going to use your credit card, only spend what you can afford to pay off *IN FULL* each month. The days of, “Oh, I’ll just put it on my card,” are over! Don’t pull that little piece of plastic out if you don’t have to. Better yet, don’t buy things that you can’t afford! It’s time to take control of your personal finances! 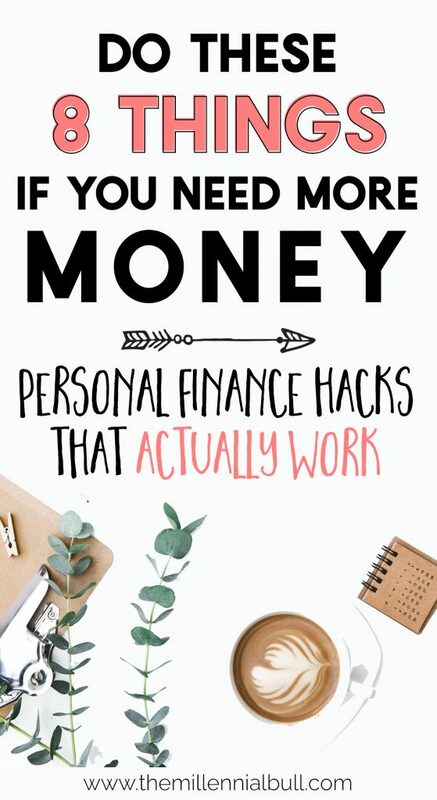 The most important thing to remember is that these hacks won’t transform your financial situation overnight. They take long-term commitment, but are totally realistic! Best of luck in 2019! BONUS: Need to earn some extra cash like, NOW? Taking online surveys is just about the most immediate way to earn extra cash when you are in a bind. Not only is it easy AF, but you can do it from home, in your PJS… or birthday suit. Whatever floats your boat. Easily one of THE most popular survey sites is Swagbucks. To date, it’s paid their members $308,244,809! Join here and get a $5 sign up bonus. This is by far my favorite website to take surveys and earn rewards. Swagbucks has been around for years, and is a fun rewards program that gives you FREE gift cards and cash for the everyday things you already do online. You can earn points (or “Swagbucks”) when you shop at your favorite retailers, watch videos, search the web and participate in surveys! Survey Junkie is another one of my favorite sites to take surveys online. It is one of the most used options to earn cash and rewards for sharing your opinions, and for good reason! There are over 3 million members registered and you can earn anywhere between $2 and $75 for taking surveys. The longer the survey, the better odds you stand for earning more! Especially if you get paired with a focus group! Another plus? You can cash out at $10 (1,000 points) which is a much better threshold than other sites! Sign up just takes 5 seconds! Survey Club is different from most survey sites because it gives you access to an entire directory of survey panel companies. So, rather than waiting for one company to have more qualifying surveys available, you’ll be connected to several opportunities! All you have to do is create an account, share a little bit about yourself, and get matched with different surveys! There are also market research and focus group opportunities that pay up to $200, as well as online clinical research studies that may earn you $1,000. $20 cash payout threshold isn’t too shabby either. I love Inbox Dollars for a few reasons. For one, you get $5 just for signing up. What better way to start? Get rewarded for watching TV and making purchases online, in addition to taking the surveys. We already watch TV and shop so why not get rewarded for it? 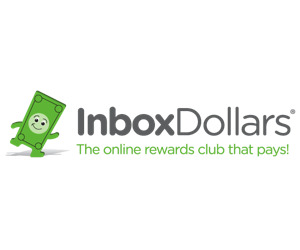 You can sign up for Inbox Dollars here. This company is awesome for several reasons. For one, if you install their browser extension, which is used for market research, you get $5/month so long as it is activated. You literally have to do nothing but what you’d normally do in order to get paid. Also, they have more survey opportunities than most, and they pay out much more for less time. I’ve gotten $10 for 10 minutes of my time, where with other sites you may only get a few bucks for $30 minutes. You can sign up for Survey Savvy here. Make your opinions count! Earn money, evaluate new products and test new advertising! ACOP has over 6 million users worldwide who get paid to participate and surveys and research projects. Points can be redeemed for cash (check or PayPal). The incentive value of surveys isn’t as high as other sites, however there are other opportunities to take part in larger market research projects with higher payouts (up to $50!). Because of that, it’s worth participating in the little ones to increase your chances of being asked to partake in the bigger ones. Vindale Research is one of the survey sites that has more options than most. Surveys are anywhere between $1-5, and they even offer some up to $50 if you are lucky! A plus? You can redeem via check or PayPal. For a longer list of online survey sites (and to get some pointers on how to navigate them), check out this article. This is without doubt the best article I have read all year. Those sites you mentioned for investing though, Swell and Acorn are they safe to use? All the same thanks for sharing this wonderful piece of information. Thanks so much Collins! Yes, they are safe to use – equipped with SSL protection, protected investments, bank level security, etc. You can find plenty of information about site/app security on their websites! Great, informative blog post. I am quite interested in ‘micro investing’ and will be looking into this over the holidays. You should definitely check it out! Great way to learn how to invest without committing too much money! Loved these tips, I’m going to implement them now and come the new year. Great advice Millenial Bull! Keep the excellent content coming! Thank you, Ben! We will! Money saving challenge is such a good idea! Great way to discipline yourself! These are a great reminder! I will definitely incorporating this into my new year! Amazing tips! Definitely going to incorporate these sooner rather than later. I love Stash! I started using it a few months ago and it’s been my favorite way to start investing. I’m learning along the way and I can’t wait for their banking option to fully roll out. Considering I can’t seem to find a bank that doesn’t have ridiculous fees, I’m curious to see how that works out. I started with Stash as well and love it! I haven’t looked into rolling out yet but if I find any useful info I will definitely pass it along. Thanks for reading! Great article – I love the investment tips! Hi , such an amazing ideas to start a blog on different niches. Really an useful post with clean and clear details. Thanks for sharing this post. Keep sharing. 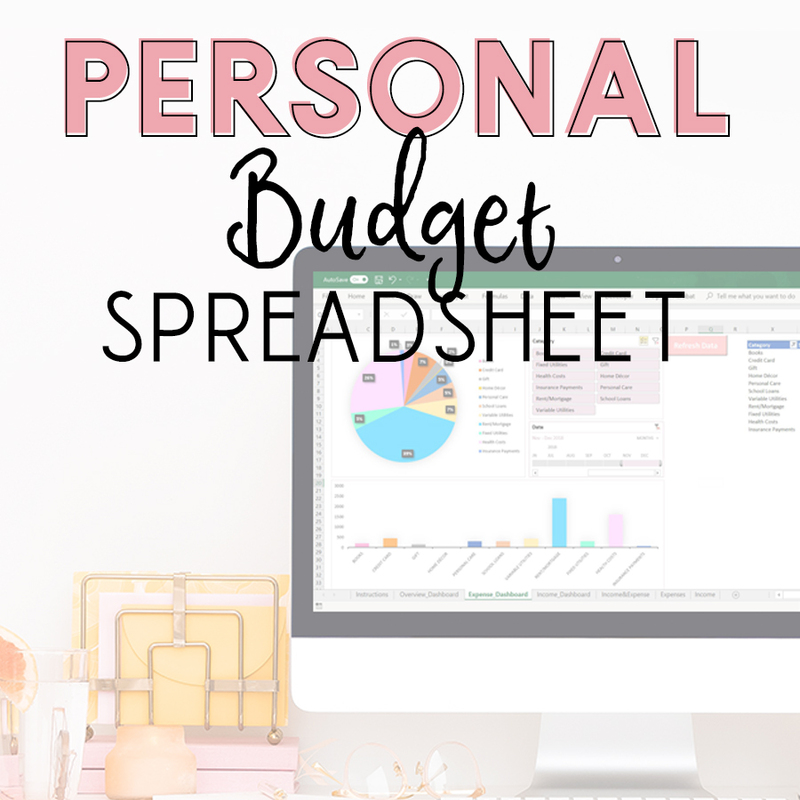 Track your income, expenses & overall budget with our Personal Budget Spreadsheet!